Negotiations with the German and French leaders give reasons to say so. President Petro Poroshenko has said that the Normandy talks on a Donbas settlement with the participation of Ukraine, Germany, France and Russia may resume. He made this statement at a meeting with Ukraine's diplomats in Kyiv on 24 August. "My talks with the leaders of Germany and France give me reasons to hope that in the near time, despite any statements [to the contrary], the Normandy format will be reanimated," he said. 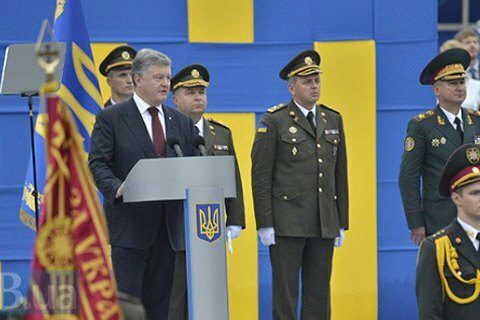 Poroshenko said he hopes that the West will keep its sanctions against Russia "until its troops withdraw from Ukraine, until the territorial integrity of our state is restored". "I very much hope that our Western partners understand how counterproductive and even dangerous the talks on any weakening or, God forbid, cancellation of sanctions against the aggressor are," he said. On 11 August, the Russian Foreign Ministry said Moscow would not take part in the Normandy talks. This happened after it accused Kyiv of plotting terrorist acts in Crimea.